Power Prog announces the signing of the international and highly occupied prog rock/pop-rock lineup, Moonbound. The first common goal is the worldwide release of their upcoming third album Uncomfortable News From The Moon from September 18th as CD, download card, digital download and as stream. Moonbound is the brainchild of vocalist, multi-instrumentalist and producer Fabio Trentini (well known for fans and the trade press in Europe for his work with acts like Subway To Sally, H-Blockx, Guano Apes, Sasha, Le Orme, Milan Polak, All Ends). Offering up an eclectic blend of hooky, 80s-influenced pop with progressive rock sensibilities, Moonbound captured the attention of audiences with their 2009’s album “Confession And Release” and its 2011 follow-up, Peak Of Eternal Light. Both albums featured the notable contributions of prog rock luminaries Markus Reuter (Stick Men) and Pat Mastelotto (King Crimson, Mr. Mister). For Moonbound’s newest album, Trentini reunited with Reuter and Mastelotto, adding an all-star cast of musicians including Tony Levin (Peter Gabriel, King Crimson), Steve Farris and Steve George (both of Mr. Mister), Tim Pierce (session guitarist for Phil Collins, Roger Waters, and Carlos Santana), Milan Polak and many more. 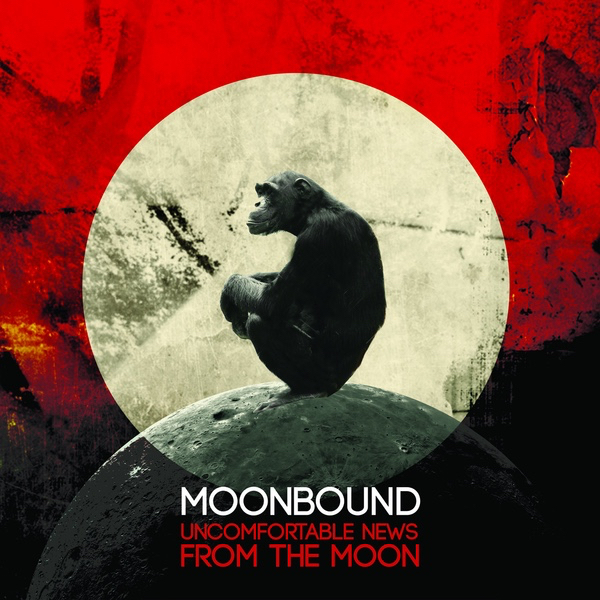 Loaded with infectious hooks, spiced with catchy melodies and laced with dark progressive themes, Uncomfortable News From The Moon exhibits Moonbound at its absolute musical and lyrical peak. And once again Trentini proves his skills as an extremely capable singer with a distinctive and empathetic voice that puts the crown on this masterpiece. An album not only for fans of the genre, mass compatibility is more than guaranteed and could make Uncomfortable News From The Moon a trendsetter in terms of modern prog rock & pop music. Touring in support of the new album will take place throughout Europe during 2015 and 2016. In the style of such legendary trios as Rush and The Police, Trentini has formed a three-man live lineup comprised of himself (bass and vocals), Milan Polak (guitar, backing vocals), and Luca Casagranda (drums, backing vocals).